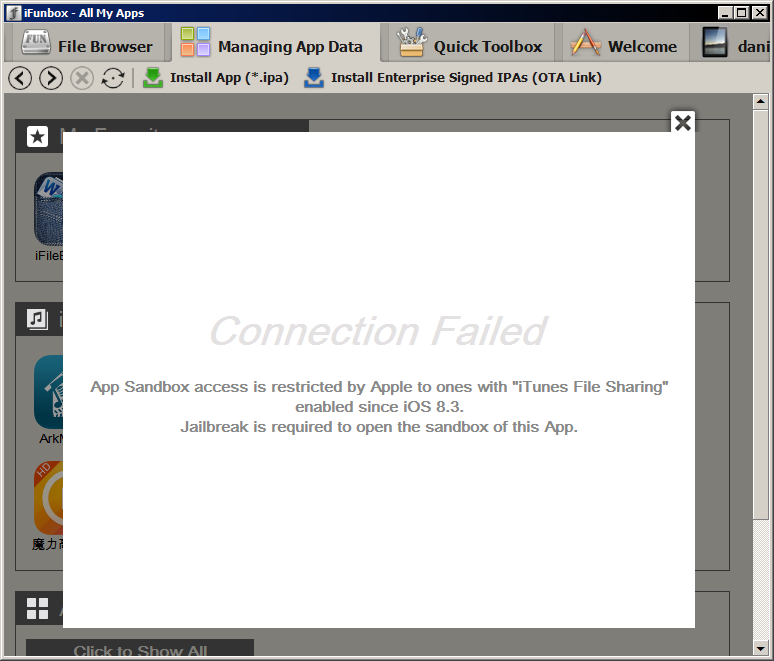 It has been recently discovered that Apple has blocked file management access to third party tools such as iFunBox and iExplorer. These tools use the Apple Sandbox and iTunes File sharing to gain access to the basic file system on your iOS device, including app directories, and doesn’t require a jailbreak. Until now. File management tools such as iFunBox, iTools, iExplorer, etc, aren’t able to access the directories on iOS 8.3. Apple had also patched an exploit that was being used by the TaiG jailbreak team. If you’re jailbroken and have OpenSSH installed, then you can have complete access to the file system on iOS. However, iOS 8.3 doesn’t have a jailbreak, which means you can’t use tools such as iFunbox to gain file system access. You can still access apps with iTunes File Sharing-enabled, such as VLC, using a third-party file management tool. There is a workaround – a long winded tedious work around – where you can add/edit files that are in a computer backup then restore your device after the edit with the newly edited backup. You need something like iBackupBot to get around the proprietary database Apple uses and to move the files in and out but it removes that whole sandbox issue. so you find way in !! if you did would you post it on youtube to show us how ! Youtube not needed, it’s really really simple. 1) I first did a complete backup of my 8.3 iOS iphone, using itunes, to my computer. If you’ve not backed-up your device before just google how, it’s pretty straightforward. 2) I installed iBAckupBot, you’ll need to buy a serial to activate the editing capabilities, but you can try the trial/demo just to see if the navigation works for you if you don’t want to immediately fork out – and who would? Again, there may well be other editors out there, perhaps some that are free, this was just the first I came across, blame Google. 3) When you run iBackupBot it opens up the backed-up data from the database, including access to apps and their folders, in a standard(ish) file explorer window. 4) You can then navigate to, highlight and (if you’ve registered a serial) export files or import files to the selected folder, whichever you prefer. 5) I imported a game cheat to Candycrush Soda – Oooh don’t you judge me! – overwriting an existing file. 6) I then closed iBackupBot and ‘restored’ my iphone through iTunes. There was no loss of data, no corrupt files and the cheat works fine. The 8.3 issues appear to be an improved security lock-out of the Sandbox, which frankly I’m amazed they haven’t done before, but as this is working on a backedup database rather than the device it doesn’t have that iOS lockout of the sandbox and so just works. Where can you download ifunbox on ios? +Bob Powell i hope that ifunbox for ios comes out soon! When ifunbox for ios comes out will it be ios 8.3 or is it free or paid on the app store?